A year ago I visited a local farmer's market and bought a cookie. A very yummy type of cookie. I bought a few more, took them home and tried to decipher their contents one by one. Cream butter and sugars together until fluffy. Beat in eggs, vanilla 'til blended. Set aside. In large bowl, mix together salt, flour, oats, wheat germ, oat bran, Grape Nuts & baking soda. Combine with wet stuff. Fold in cranberries and raisins. Roll into 1+” balls, flatten on ungreased cookie sheet (or parchment lined sheet). (These spread so I only put 12 on a sheet instead of 16 as usual.) Bake 375 F for 8-13 min. Transfer to cooling rack. Makes 4 dozen 3" size cookies. ****It still needs some tweaking, but it is awfully good. Any experienced bakers out there? I'd love to hear your recommendations for improvement. Maybe decrease amount of butter or egg? Add nuts? Robin's Merry Men - Part 2, originally uploaded by pichurrayic. Well the party was over in 90 minutes! Nice and quick! We had gorgeous weather and the kids had lots of fun. We had visits from Little John, Prince John and King Richard. 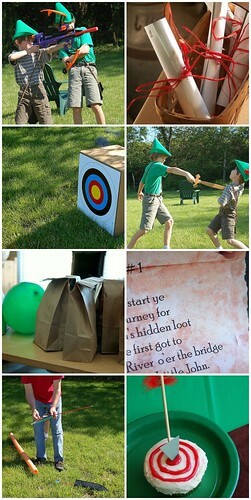 Robin and his men tried to cross a river by fighting Little John with long sticks (pool tubes), decipher clues and complete archery events to gain more clues in hopes of finding Robin's loot. Then they enjoyed green lemonade and bullseye cupcakes made by my daughter. All in all a good day. Just popping in to show you the before and after photos of my thrifted $2.00 skirt. I like long skirts but I thought a shorter one was in order. Note to myself: taking photographs at different times and on different days with different weather is not a good idea because of the different colors of the same skirt! So I simply cut off the border print (which was my least favorite part of the skirt), ironed the seams and sewed the hem. This is my 7 year old modeling a hat for me. My 10-year-old (his real birthday was last week) decided he wanted a Robin Hood theme. Several months ago I agreed that it sounded like an interesting topic as I imagined full-garb costumes hand sewn by me for each invitee, lots of bows that we'd whittle from tender tree saplings and string with ? ... but alas, none of those things happened. Robin Hood Hats made from green foam sheets and red feathers. Here's a good video to watch on how to make your own. Pouches made from brown felt and a crocheted chain of yarn for the handle to hold all the treasure. Pretty good for 10 bucks! Treasure Chest. I was going to have Little John (aka my husband) make one from corrugated, but he's so swamped at work, and Michael's was having a 60% off sale, so we're using this one instead. Pretty good deal, I say. Don't you wish the loot was authentic? We filled it with coins and gems (the gems were on clearance at Michael's too... good thing!) Now I just need to stow it away and make clues so the boys can find it. I'll share some After-Party scenes next week, but for now, I've got to go make some bulls-eye cupcakes. Good for littler hands and 40 year old eyes! but many of them are like little works of art. Yes, we now have 5 good ones and 1 slightly chipped one. Oh well. They're still sweet. It was stained in parts, but that doesn't matter. I'm going to cut it apart and use only the embroidered parts. 7. a red skirt to re-do. I'll show you that later. So I threw in some leeks, zucchini, shredded carrots, and yellow pepper with the remainder of ingredients and well? It passed. Some large blue bell jars and some pretty embroidery. The birds and nest were embroidered by someone's 'grandmother'. It was in a frame with little boxed sections, so the exposed fabric was darker than the fabric beneath the wood. When I took the frame off and peeled back the paper backing, I was glad to see that the fabric had not been glued down, but instead had just been taped around the edges. This nest is so sweet and I think the technique for making it is interesting. Little tufts of wool. This of course, is my favorite bird of the bunch. I like the colors. Whoever made it obviously had a good time while sewing down every little stitch. Okay, so today (Saturday) is a new day... I'm off to more 'tag' sales. What do you call them in your neck of the woods? The 4 banes or 4 boons? Cotton-tail and even baby Peter have been spotted around our yard during this springtime. Methinks that they've been living beneath our back porch. Seriously though... I hope they stay out of the garden. You can't tell yet, but this area of weeds, about 20' x 14', will be our future vegetable garden. On Saturday, we removed all those weeds, flung many o' these over the fence and covered the spot with black cloth. After reassessing the amount of soil needed to fill the area and realizing that neither of us wanted to carry ???????? bags of peat, manure and soil uphill, (having a truck dump a load is out of the question) we came up with the raised bed box solution with ample walkways between boxes. A box has been made. Four others need to be assembled, lots of digging and filling in with said soil needs to be finished and then plants and seeds can be planted. The next difficulty is watering. We're thinking weeping hoses or a sprinkler from a pole. Any suggestions? Off topic slightly: If interested in identifying various caterpillars, I found this site to be helpful. Yes, yesterday was the day I was supposed to name the winner of the giveaway, but honestly, the day flew by (my children were/are taking Stanford Achievement tests for several days) and although I did pick a name and took pictures, I was just too tired to post about it. So I'm sure you understand. Thank you so much for all the fun comments ~ a giveaway will always help lurkers into de-lurking ~ it was the most comments ever! Thanks! Recently we borrowed Wee Felt Folk from the library and have just now been able to 'sit down and enjoy it'. Several years ago, I first saw some of Sally Mavor's beautiful little folk at Magic Cabin Dolls and ended up purchasing some of her kits. I put the kits away in a 'safe' place to do later. Having moved and rearranging things, I know they're somewhere in the house still. My daughter's been asking to see them, but in the meantime, she followed the directions in the book and made her own. I'd like to introduce Flora. Isn't she sweet? Congratulations, Florence! Just email me your info, and I'll send off your prize! And once again, thank you all for the fun and sweet comments from before. Note: Only 1 day left for the giveaway! Happy Belated Mother's Day. This past week and weekend were very full with a piano recital, test practices, schooling, and major weeding (more of that later). Needless to say, the cards and gifts for mother's day were few and last minute. However, I realize that those things don't really matter. It was good to be together and enjoying each other's company. I did scoot out Saturday evening and bought some meal fixin's so that my children could fix 'linner' (lunch and dinner combo) and 10 tulips from the local (but fancier) supermarket. We added in some wild phlox that my boys had picked that day et voici! A beautiful bouquet. "Look away from the camera - mom's taking a picture for her blog!" My children set the table, poured orange juice, milk and wine into the appropriate wine glasses and served me Poulet Orange (orange chicken) and mache with tomatoes. We had pound cake with ice cream and strawberries for dessert. They even cleaned up the kitchen! Gerberas I had planted a few weeks ago in a self-watering pot - doing well. And yes, they're really this bright! As I said, Saturday was spent weeding the future veggie garden and beginning to weed around the house. We need to finish some raised bed boxes for the veggies, pull out unwanted paving stones that were used by the former homeowner as flower bed edging but only look like crooked teeth right now, and yank out a 'pond'. This 'pond' consists of two barrel containers that originally were part of a 'fountain' (another former homeowner's decoration) and might have had fish or frogs living it? Right now, it looks like two barrels of mucky, soon-to-be-infested mosquito pools. Lovely. Gerberas in another self-watering pot - trouble! ... is my 'what happened?' pot of Gerberas. I think I over-watered this one. Or maybe I killed the roots. Any ideas? So as to not gross you out, I turned this packet over - that little pink bump to the left is his mesiodens. My littlest had his extra tooth (mesiodens) pulled today. We drove over an hour each way in the pouring rain to the oral surgeon (who was great fun by the way) and back home. My little guy was a trooper and very sweet, very cooperative. After the 'gas', I had barely left him and gone to wait in the waiting room when the Dr entered with tooth in hand. Procedure done in less than 5 minutes! Whoopee! No, it's not my 100th post (missed that one) and no, it's not my 200th post (not yet). It's just that I've had her for awhile. After I saw Stephanie's from her previous blog, (scroll down) I searched for one of my own with the intent of giving her away. She's been wrapped in tissue paper and stored away in a box on a shelf. It's a tad different - probably newer. It's larger than I expected. But isn't she cute? Just not my 'style'. So... I thought I'd share her with someone who would appreciate her more. Is there a catch? Not really, except I would like her to go to someone with a little girl or boy and not to ebay or some such site. So I would like you to take a picture of her in her new surroundings and post it on your blog. Sound good? Just leave a comment. I'll pick randomly from those in 1 week. Enjoy!